Information on future job opportunities is useful for a range of purposes. It can help students and career advisors make choices about training pathways, and can help policymakers in their long-term planning of the education and training system. This report provides forecasts of job openings by industry and occupation for new entrants to the labour market from 2017 to 2024. These job openings are estimated by accounting for both growth (or decline) in the occupation or industry as well as the replacement needs due to workers leaving the occupation. replacement needs; that is, the new workers required due to worker retirement or those leaving the occupation. This information may be useful to various stakeholder groups. Students and career advisors, for example, might use the information to make choices about occupational paths to follow, while policymakers might use the forecasts for long-term planning in education and training, as well as for workforce development purposes. The researchers use a dynamic general equilibrium model to forecast employment by industry and occupation at high levels of detail. The forecasts from this model, as with forecasts from any other model, have a degree of uncertainty associated with them (Richardson & Tan 2007). That being said, many countries around the world continue to use labour market forecasts to guide planning. The total number of job openings over the forecast period 2017 to 2024 will be about 516 600 per year (4.1 million in total), with more than half of these resulting from replacement demand. The results show employment continuing to shift towards higher-skill jobs in the labour market, with a slight acceleration in this trend with higher productivity growth. The highest number of job openings, 121 700 per year (973 600 in total), will be in professional occupations. The second highest, 71 300 per year (570 600 in total), will be for managers. These figures reflect the demand in higher skill levels. In some occupations, a high proportion of the job openings is due to replacement demand rather than employment growth. Very high replacement demand is seen in occupations with low entry requirements and low wages, which to date have typically attracted young people, who stay in the occupation for short periods. Examples due to replacement demand include hospitality workers, checkout operators and cashiers, and food preparation assistants (75.6%. 89.4% and 80.9%). Replacement demand is high for occupations with relatively older workforces, a consequence of workers’ proximity to retirement. An example of high retirement-replacement demand includes farmers and farm managers, with 63.3% of the 80 900 job openings (10 100 per year). Reasonably high proportions of job openings due to replacement demand are also found amongst technicians and trade workers (for example, 60.4% for bricklayers, carpenters and joiners and 61.1% for automotive electricians and mechanics). This can have training implications. As experienced workers leave, there are fewer available to supervise apprentices. Additionally, as apprenticeship training takes time, and completion rates can be low, sufficient recruitment is needed to avoid future shortages. The analyses demonstrate the importance of considering replacement demand when assessing job openings for new entrants. Job openings can reflect future job opportunities; they can also provide a way to assess future training needs where training is required in an occupation. 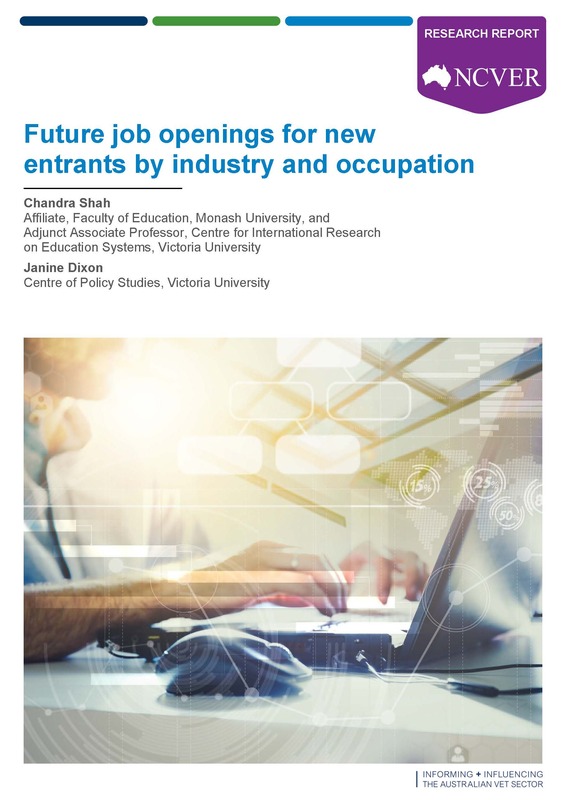 This report provides forecasts of job openings for new entrants to the Australian labour market by occupation and industry for the period 2017 to 2024. Job openings in an occupation are a result of growth in the occupation and the need to replace workers retiring from, or permanently leaving, the occupation. The forecasts provide job seekers, students and career advisors with information on future job opportunities, and helps them to make informed choices about which education and training courses to undertake. Policymakers may use the forecasts for long-term planning in education and training and workforce development. These employment forecasts — achieved through modelling — reflect the industrial and occupational structure of the economy as it adjusts to changes in technology, business investment decisions, government spending, household preferences and international trade. The outsourcing of services by firms, globalisation and the offshoring of jobs have an additional effect on the structure of the economy, as may the reorganisation of firms and the adoption of new human resource management practices. The report considers two scenarios for the Australian economy: the first and most likely scenario is based on historic paths to date; and the second, on high productivity. In the first scenario, we model the most likely outcome for the Australian economy, given all of the information available at 30 June 2016. In the high-productivity scenario, we assume a higher productivity growth than in the most likely scenario. This method for forecasting job openings uses three steps. In the first step, VU1, a dynamic computational general equilibrium model, is used to forecast employment (headcounts) and expansion demand, by industry and occupation. Next, replacement demand is forecast. Finally, the results from the two stages are combined to derive forecasts of job openings. forecasts of changes in technology and consumer tastes derived from unpublished trends calculated by the Centre of Policy Studies, Victoria University. Replacement demand provides a measure of the number of added workers required in an occupation as a consequence of worker retirement or those who permanently leave the occupation. A cohort-component method is used in combination with a time series method to forecast replacement demand. The model uses data from the ABS. The third step combines results from the first two steps to obtain job openings. If employment increases in an occupation, then job openings in the occupation are the sum of expansion demand and replacement demand. On the other hand, if employment decreases, then job openings equal replacement demand. Job openings can provide a measure of the minimum number of additional people to train in instances where training is required in the occupation. The VU model forecasts the gross domestic product (GDP) to grow, on average, by 2.7% per year between 2017 and 2024. By comparison, GDP grew 2.8% per year between 2011 and 2016. The forecasts reflect the overall pattern of weak investment and slow growth in productivity observed here and overseas over the last several years. Had it not been for population growth, the economic outlook for Australia would be weaker. The VU model produces forecasts of employment (headcounts) by industry and occupation. Total employment will increase from 11.8 million in 2016 to 13.7 million in 2024. This represents an increase of 1.87 million people in employment, or 15.8%. On a year-on-year basis, employment will increase, on average, by 1.8% between 2016 and 2024, compared with the historical increase of 1.4% between 2011 and 2016. Consistent with recent trends, the results suggest a bias in employment growth towards occupations requiring higher levels of education and training. In particular, employment for professionals will increase by 2.4% per year, to 3.3 million in 2024. This means that almost a quarter of all workers will be in a professional occupation in 2024. Among professionals, the highest rate of increase in employment will be for accountants, auditors and company secretaries (2.9% per year), likely due to growth in industries that demand these occupations. The strong growth in demand for midwifery and nursing professionals (2.5% per year) reflects the strength of the health care and social assistance sector, in particular residential care and social assistance, which receives a boost in the model through government expenditure on the implementation of the National Disability Insurance Scheme (NDIS). Other occupations which also see a growth in demand from the implementation of the NDIS and population ageing are health and welfare support workers (2.3% per year), child carers (2.6% per year) and personal carers and assistants (2.4% per year). While the growth in employment for many trade and technician occupations will be weaker than average for all occupations because of continuing weakness in construction, the demand generated through the rollout of the National Broadband Network (NBN) will mean the demand for information and communication technologies and telecommunications technicians will continue to grow strongly (2.2% per year). The weakness in construction, as well as the slowdown in mining, will also affect the demand in their low-skill occupations (for example, construction and mining labourers). On the other hand, the low Australian dollar will mean recovery in some subsectors of manufacturing, especially where there is a strong preference for ‘Made in Australia’ products (for example, food and beverages, pharmaceuticals and speciality high-technology equipment). Retail trade’s share of total employment will slightly decline from 10.6% in 2016 to 9.7% in 2024. This is mainly associated with the overall household expenditure on manufactured goods3, which has been weak and is underscored by stagnation in wage growth and a gradual reallocation of the household budget towards the higher costs of services, utilities and health care. The growth in employment in the sector, relative to growth in output, has also been weak in recent years, due to technical changes in the sector (for example, automation and the rise in online shopping). The continuation of these trends in tastes and technology leads to the weakness in the sector over the forecast period and consequently below-average growth in demand for retail managers and sales workers. The total number of job openings over the forecast period of 2017 to 2024 will be about 4.1 million, with more than half of these resulting from replacement demand. On average, there will be 516 600 job openings per year. The highest numbers of job openings, 121 700 per year (973 600 in total), will be in professional occupations, with replacement demand the source of 40.8% of these. Within professionals, the numbers of job openings per year for school teachers and midwifery and nursing professionals will be 15 400 (123 300 total) and 16 200 (129 600 total), respectively. However, replacement demand will be the source of a larger proportion of job openings for school teachers (64.2%) compared with midwifery and nursing professionals (49.6%). Replacement demand will be the source of less than 40% of all job openings in 16 of 23 professional occupations. The second highest number of job openings, 71 300 per year (570 600 in total), will be for managers. Of these, construction, distribution and production managers had the highest number of job openings, with 10 500 per year (84 000), followed by farmers and farm managers, at 10 100 per year (80 900 total), with replacement demand the source of 53.8% and 63.3% of these, respectively. Of interest, farmers and farm managers have a much older workforce than most other occupations, which means it has a relatively higher replacement rate than other occupations. However, the rate may be slightly over-estimated, as many farmers tend to continue working past the age of 70 years, the cut-off age in the modelling for compulsory retirement. Other high numbers of job openings were for business administration managers, with 8700 per year (70 000 total), and retail managers, with 8400 per year (66 800 total). The remaining seven categories of managers ranged from an average of 2100 to 7300 per year (17 100 to 58 700 in total). Job openings for technicians and trades workers will be 57 800 annually (total 462 000), with half of these resulting from replacement demand. In some trades, replacement demand will be the source of a much higher proportion of job openings; for example, 60.4% for bricklayers, carpenters and joiners and 61.1% for automotive electricians and mechanics. Much of the replacement demand in such occupations will likely be from experienced workers leaving, which may have implications for training formats, as fewer experienced workers will be available to supervise new apprentices. By contrast, replacement demand will be the source of only 23.3% of job openings for information and communication technologies and telecommunications technicians. The relatively low replacement rate for this occupation is not only because its workforce is relatively young, but also because of the current high demand in the information and communication technologies sector from the rollout of the National Broadband Network. The high demand means that existing workers are less likely to leave for alternative occupations, and employers tend to retain their current workforce. Personal carers and assistants, and hospitality workers are the two largest occupations among community and personal service workers. Job openings in these two occupations will be 13 600 and 20 400 per year (108 600 and 162 900 in total), respectively. Replacement demand will be the source of a much higher proportion of job openings for hospitality workers than for personal carers and assistants (around three-quarters compared with just fewer than half). The hospitality worker occupation, like a number of occupations in the retail trade, has low entry requirements, pays low wages and employs large numbers of young people, who stay in the occupation for short periods. The combination of these factors means turnover is high in the occupation. Another 108 400 job openings in total will be available for health and welfare support workers (6400 per year) and child carers (7100 per year). Replacement demand will be the source of about half (53.3%) of the 68 700 job openings per year (549 900 in total) for clerical and administration workers. This proportion will be much higher for some occupations in this group; for example, 63.8% for receptionists. Job openings for sales workers will be 58 300 per year (total 466 400), with replacement demand a major source of these (77.7%). About two-thirds of these job openings will be for sales assistants and salespersons, with around 80% being a result of replacement demand. Job openings for checkout operators and office cashiers will be somewhat fewer (9500 per year, 76 400 total), but the source of most of these will be replacement demand (89.4%). The high replacement rate for the occupation is a product of its very young workforce (60% is under 25 years), who stay in the occupation for relatively short periods. Job openings for machinery operators and drivers will be 26 100 per year (total 208 500), with 6800 per year (54 400 total) of these for truck drivers. About 60% of job openings for truck drivers will be the result of replacement demand. Replacement demand will be the source of two-thirds of the 51 400 job openings per year (410 900 total) for labourers. About a half of these job openings will be for food preparation assistants (14 200 per year, 113 700 total) and cleaners and laundry workers (12 400 per year, 98 900 total). While replacement demand will be the source of 56.5% of job openings for cleaners and laundry workers, it will be the source of 80.9% of job openings for food preparation assistants. The high-productivity scenario assumes that productivity makes an additional contribution to gross domestic product (GDP) growth, of 0.4 percentage points, compared with the most likely scenario, and that aggregate employment remains unchanged. For simplification, the model assumes that productivity improvement affects the technical efficiency of all industries equally, which may be unrealistic, and the impact on industry growth will also vary because of demand factors. The simulation also forecasts a small devaluation of the Australian dollar and a small net shift in the distribution of employment towards professional, scientific and technical services and manufacturing and away from retail trade, and health care and social assistance. At the minor occupation level, the shift is generally, although not always, towards higher-skill occupations, which suggests some skill-biased technical change and some substitution of labour with technology. The results show employment continuing to shift towards higher-skill jobs in the Australian labour market, with a slight acceleration in this trend with higher productivity growth. In most occupations, replacement demand contributes more to job openings than does expansion demand. Public policy on education and training could focus on those job openings where training takes some time to complete. Training for jobs in occupations with high turnover could be the responsibility of employers. The magnitude of these forecasts is indicative. They provide a basis for planning workforce development and for identifying where to focus public subsidies. The information adds to the existing labour market information enabling individuals, employers and training agencies to make informed decisions. Many assumptions underpin the modelling. Clearly, changing the assumptions of key variables in any model will generate a different set of forecasts. For example, any revisions of Australia’s current and projected population and labour force are likely to affect forecasts. The origin of VU is the MONASH model, whose development goes back to 1993 in the Centre of Policy Studies (CoPS) at Monash University. In turn, the development of MONASH stems from the ORANI model, first developed in the mid-1970s. However, the current version of VU includes significant advances over the MONASH model. Prior to the recent restructure of the public service, the Bureau of Resources and Energy Economics provided this information. Manufactured goods are largely discretionary in the household budget.